Star Power: The Legend and Lore of Cyclone Taylor by Eric Zweig is another in the Lorimer juvenile non-fiction sports history. Other hockey titles include Long Shot: How the Winnipeg Falcons won the first Olympic hockey gold , also by Zweig, Pink Power: The First Women's Hockey World Champions by Lorna Schultz Nicholson and Small Town Glory: The story of the Kenora Thistles' remarkable quest for the Stanley Cup by John Danakas and Richard Brignall. Star Power is a biography of hockey's first coast-to-coast superstar. Cyclone Taylor amazed with his skating speed, his puck handling trickery and his goal scoring. In the early 1900s and 1910s he played all across Canada, making him equally famous in Ontario as in BC. Everyone knew Cyclone Taylor was hockey's best player. There is no doubt that Cyclone Taylor was a legend. The author admits much of the Cyclone story is exactly that - legend. His hockey career was so long ago that it not only pre-dated video and even many written archives, he even pre-dates the National Hockey League itself. Many of the stories that make Cyclone Taylor a legend are not verifiable, and may be nothing more than myth. All of that should make for a great story, but I think it misses the mark in this juvenile fiction piece, at least in comparison to the Winnipeg Falcons and the Canadian women's team in other books in the Lorimer series. The Falcons and women were classic underdogs, an easy sell to readers of any age. Taylor was a hired gun in a very foreign time, a vagabond star who was never around long enough to develop attachment. And because of that it would be tough for any author to lure a young reader in right off the bat like Zweig accomplished with the Falcons. If your child is interested in hockey history, then Star Power is an ideal title. 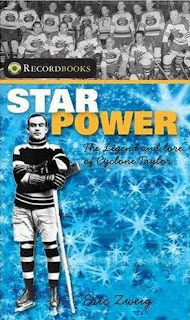 Even if you are an adult looking for a quick read on the legend of Cyclone Taylor then Star Power is a great pick up. The book is 128 pages split into ten chapters. There are four black and white photos inside the book, including Taylor in the uniforms of the Ottawa, Listowel and Vancouver. There are also numerous tidbits of fascinating facts and highlights of hockey history.